Contact Author - Charles Carfagno Jr. Madness of My Dreams by Charles Carfagno Jr. is the story of a fantasy writer named Charles. He had an accident in which he suffered a head injury and was in a coma for some time. That changed his life and now he has no idea what is real and what is not. His dreams have the tendency to be real, whatever he dreams, and he wakes up with its side effects. Soon the lines between reality and dreams blur so much that he is admitted to an asylum by his family. But he is heavily sedated there and now he is trapped in his dreams. What will happen to him? Can he escape the horrors of his dreams or will he have no way to get back to reality? In the novel, the lines between reality and fantasy are blurred. I admit, the cover of the novel drew me in and I am glad that it did. This supernatural fiction tale has elements of mystery, fantasy and suspense, the perfect ingredients for a nail-biting novel. The story itself was interesting enough to get me started and, once I started, I just didn’t want to stop. I enjoyed how the characters were given the opportunity to grow and simply take the reader on a journey. The story was intense and very interesting. It had layers on layers of great pieces of art that I wanted to unravel and understand. I loved Charles’s character. He is a rounded character that grew and developed to become one of my favorites. I loved the plot, the flow and the pace of the story. This is one of the best novels that I have read so far this year. Very enjoyable! Madness of My Dreams by Charles Carfagno Jr. triggers one question in its readers: does the thought of living inside your book with all the characters that you've written excite you? Well, Charles Inkwell was excited at first, when he found himself in a dream that allowed him to meet his characters, interact with them, and spend time with them. However, things turned too ugly too fast. The characters of his book are no normal beings. Most of them are fierce and violent people. The result is a lot of action and a lot of pain. The strangeness of the situation is that Charles even wakes up bruised, scarred, and hurt. His wife, Jill Inkwell, found his claims inconceivable -- not to mention threatening to himself and everyone around him -- and admitted him to an asylum. Soon, it was evident that handling this patient was not going to be easy for Doctor Blair, Nurse Helen Price, and others in the staff. They all considered him like every other patient who was admitted to this place. Nevertheless, when Nurse Price found his journal under his pillow, she could not believe the entries that Charles had made. She began to believe that maybe Charles was not hallucinating after all. The plot of Madness of My Dreams by Charles Carfagno Jr. is packed with twists and turns. There is a lot of action and intrigue in this story. Charles Inkwell cannot believe that he has a chance to meet with his characters and talk to them, but this exhilaration soon turns into chaos when bruises become real. He gets trapped in his dreams with nowhere to turn for help. There is an urgency in this story, where he must act fast to find a way out of his dreams or risk everything, including his life. The characters are beautifully written and are easy to connect with. I understood and yet detested Jill for admitting Charles into the asylum. Was it an easy choice for her or did she have no other choice? I would recommend Madness of My Dreams by Charles Carfagno Jr. to fantasy fiction lovers, who enjoy a quick yet engaging read. “As you read this, please don’t think of me as crazy, because I’m not, but then again… all crazy people think they’re not.” After his car accident landed him in a coma some years back, fantasy author Charles Inkwell starts to physically experience the story he wrote while he dreams, meeting his characters, and waking up injured. As the dreams start to affect his reality, leading to scary outbursts and delusions, his family admits him to an asylum out of fear. Worse yet, an ominous being is making Charles pay the debt of his late father. His life hangs in the balance. 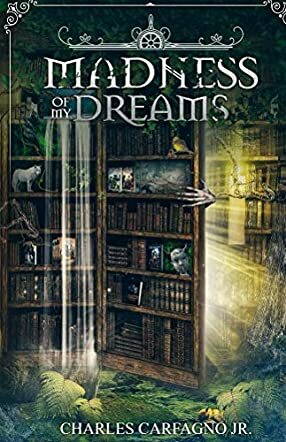 With a solid premise, Madness of My Dreams by Charles Carfagno Jr. is undeniably intriguing from the start, as readers are introduced to Patient 714, aka Charles Inkwell. His dreams and reality, as well as the different characters’ perspectives, make a great scope for the story. It is quite ingenious of Carfagno Jr. to tie this story to his A Demon's Quest: The Beginning Of The End tales without alienating readers who haven’t read the series. Character-wise, I gravitated more towards Nurse Helen Price and Father O’Leary. Their roles are well written and crucial in moving the plot forward. There’s a funny reference to Spam, one of the few lighter moments other than the cheeky ending that longtime fans of Carfagno Jr. will understand. It’s quite action-packed as well. All in all, Madness of My Dreams is a solid read with a good twist. Madness of My Dreams is a work of paranormal and supernatural fiction penned by author Charles Carfagno Jr. In a meta-fiction setting of writing about writing, we meet the novel’s author, Charles Inkwell, when he suffers a devastating car crash and his whole life is turned upside down. With head injuries to contend with and a coma he suffers through, Charles finds himself travelling through the worlds which an author keeps in their head, only to realize that both his dreams and reality are blurring. As real world pressures close in, the dream world gives him injuries and experiences that he can’t explain, and we, as the audience, watch his psyche unravel as he travels down the layers of dreams within dreams. This is a very abstract and esoteric novel that will suit deep thinkers, poets and philosophical readers alike. The story line very much sticks to the writer and the character-driven narrative, with plot elements floating in and out in a very dreamlike state to give that overall psychologically damaged narrative feel. Author Charles Carfagno Jr. manages the split in psyche really well, navigating the strangeness of character Charles’s experiences without getting too deep and lost for the readers to follow him. The reactions of the outside world to Charles’s traumatic event are both tragic but understandable, and the reader builds a deep connection between themselves and the author as they follow his thoughts through darkness and light. Overall, Madness of My Dreams is a sharp exploration of head trauma with a literary imagination.